Collins Brothers is a large commercial mover. Each year we move millions of square feet of office furnishings and fixtures as well as factory and warehouse space. We have the personnel that can completely organize a commercial relocation and oversee the move to completion. Collins Brothers provides complete project management services for all your commercial office relocations as well as industrial moves. Collins Brothers can analyze the client’s requirements, design a plan for the relocation and monitor the entire process to increase efficiency and reduce cost. All of our project managers have over 10 years hands on experience and have managed the movement of millions of square feet of office and industrial space. We operate a specially designed fleet of vehicles from all our terminals. We have all the equipment necessary to handle any size commercial relocation. This includes, but is not limited to, thousands of dollies, miles of masonite, safe moving equipment, rigging equipment, computer handling equipment, etc. Our team of professionals will take the worry out of your commercial relocation. We will design and implement a marking and tagging system to ensure all items are placed in their proper location at destination. This is a very important aspect of the commercial relocation. Great care is taken by our supervisors to ensure that each and every item is properly tagged for movement. Our crew of experienced professionals can pack all items for safe movement. Our personnel are highly experienced in packing computers, artwork, and libraries. Special racks are available to pack libraries, file rooms, etc. for movement. Of course, anything that we pack, we will unpack at destination and place in its proper location. Collins Brothers offers complete disconnect and reconnect services. Our technicians are second to none and have years of experience handling all types of equipment that is found in any office environment. Once the pre-planning and packing has been successfully completed, the physical move to your new location will be handled in a precise, efficient manner. 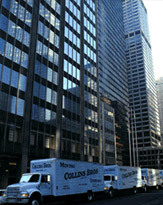 Since Collins Brothers has a large labor force, we are able to move large office areas in short periods of time. There is always sufficient supervisory personnel to solve problems should they arise. As the furniture and equipment arrives at the new location, it is placed according to your floor plan. When your employees return to work, their offices will be ready for business. What this means for you is no interruptions and no down time. Whether you have 2,000 or two million square feet to move, you will enjoy peace of mind with our professional service.